Born in London, Ontario CANADA on June 19, 1902, Guy Lombardo went on to become the most popular band leader on the American music scene. His ensemble, The Royal Canadians, sold at least 100 million records. Between 1929 and 1952 there wasn't a single year that a Lombardo record didn't chart - 21 of them at number one. He is arguably the most successful entertainer to come out of Canada - ever. The great stars who guested with Guy on wax. An appreciation of Guy's brief but varied career in Hollywood. A look at some of the dance halls, movie theatre and clubs that helped make Guy Lombardo famous during his formative years in London. 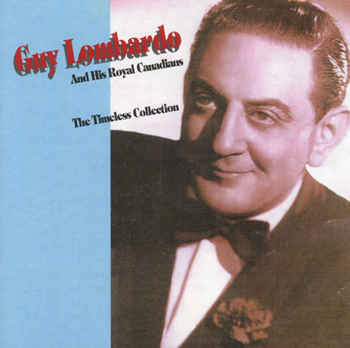 Guy Lombardo and His Royal Canadians: The Timeless Collection has made its debut on CD in time for the 100th birthday of the maestro. This collection of 20 tracks features some of the band's greatest hits, including Boo Hoo, Sweethearts on Parade and (need we mention?) Auld Lang Syne. It's available for $25 through The Friends of Lombardo, P.O. Box 58, Lambeth Station, London, Ontario, N6P 1P9. The price includes shipping and handling. Armed Forces Radio Service broadcast from The Roosevelt Grill in New York City. Funny thing, Guy doesn't sound like himself. Could the whole thing be a fake? Guy Lombardo is the surprised guest on NBC Radio's This Is Your Life which chronicles the life of the London-born bandleader. The discs for this long-lost 1949 program were recently discovered by Doty Docs and lovingly restored by Peter Nagy of Dawn of Sound. The Royal Canadian play during "Guy Lombardo Day" as London, Ontario marks 100 years as a city. Great shots show the Lombardo conducting style. Segment from a very nice convocation address Guy gave to some University of Western Ontario grads. He reflects on his upbringing, his father and why on earth a high school drop-out should receive an honourary degree. Guy came home to promote his autobiography: Auld Aquaintance. In between signing copies for old biddies he was interviewed by newsman Jack Burghardt on his London roots. Say it ain't so, Guy! Reprint of a 1957 article by columnist Robert W. Dana breaks the news that The Royal Canadians will be leaving The Roosevelt Grill in New York City, their wintertime home for almost 30 years. As things worked out, Guy didn't leave the place until 1962 and didn't stop conducting until his death. For those of you who want to see the absolute end of the story. Photos of Guy's grave at Pinelawn Memorial Park, New York. It's also the burial site of his younger brother Lebert. In-depth report by journalist Jonathan Sher about the recent legal fiasco surrounding London's Guy Lombardo Music Centre. More mesmerizing than a car accident - but just as tragic. Clearing house for all things Lombardo offers some good links and allows you to share your obsession with other Royal Canadian fans through the club newsletter. Unfortunately, the design of the site needs a major overhaul.